To be sure, the Affordable Care Act (ACA) has expanded Americans’ access to health insurance, and federal subsidies have made the premiums more affordable for millions of previously uninsured workers, who now purchase coverage through the ACA’s state health exchanges. But the program hasn’t eliminated concerns about cost. First, the ACA extended insurance to new segments of the U.S. population, including lower-income people who now feel strained by having to buy insurance – despite the subsidies that reduce their premiums. 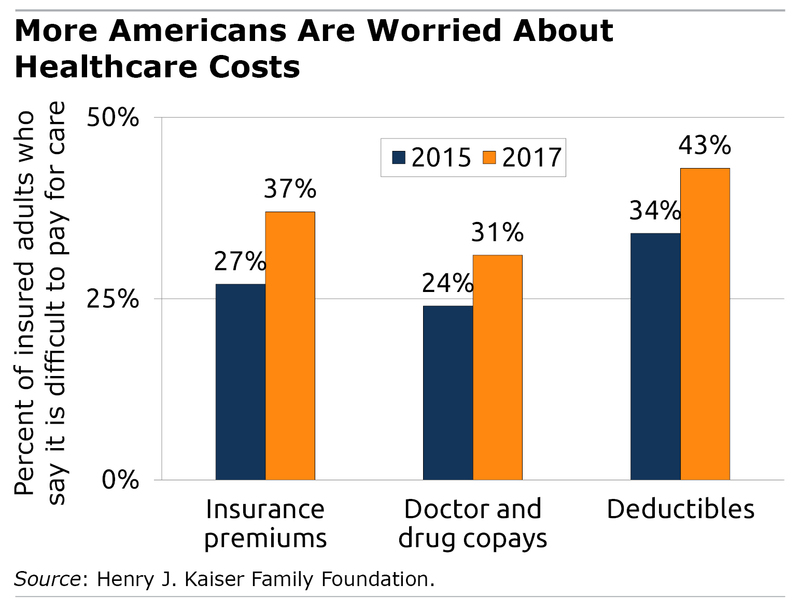 Second, many ACA enrollees opt for insurance plans with lower premiums, but that means they face higher yearly deductibles – potentially exposing themselves to thousands of dollars in out-of-pocket costs when they get medical care. Another reason so many Americans feel strongly about health care could be that even people who personally have good employer health insurance have family members struggling to pay for their insurance or care. One in three adults told Kaiser they have family members who have had to skip dental checkups, medical tests, or prescriptions or have postponed seeing a doctor. People are finding myriad ways to come up with the money needed to pay their insurance premiums or medical care, from cutting back on vacations and grocery bills to spending down their savings and working extra hours, Kaiser said. The debate over health insurance on Capitol Hill is extremely complex and contentious. The public seems more united, however, the Kaiser poll suggests. 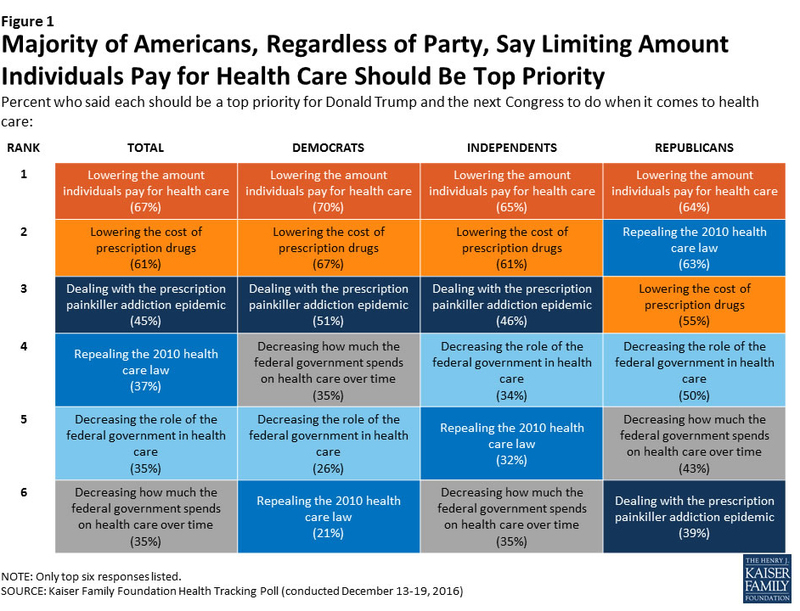 Two out of three adults – Republicans and Democrats alike – rank reducing costs as their No. 1 health care priority. One interesting fact emerges from the graph: Common ground OUGHT to be found in the lowering of Rx costs. Will it be? At the moment, this seems unlikely. The cost of one prescription medication I take has risen from $45 to $98 in a few years even with insurance that pays 80% of the cost. So now I order it from India and pay $45 for the same drug, made by the same drug company, Pfizer. The USA pays so much more for the same drugs! The NHS in Scotland provides free prescription drugs for all residents. As a single payer system, the government bargains directly with the drug producers. Free prescriptions has proven cheaper than means-testing (eliminates bureaucracy). Which prescription drugs are paid for is decided by a national science council and that can be a bone of contention. For 95% of common ailments, however, NHS Scotland provides universal prescription drug cover for roughly 50% less per 100,000 of population than is paid by insured people in the US. The article noted lower-income people feel strained having to buy insurance because of the mandate. But few are aware you can avoid the penalty without having to buy ACA compliant coverage. An established “waiver” provision generally says, if the lowest cost ACA compliant Bronze level plan in your area exceeds about 8.5 percent of your income, you pay no penalty. There is an IRS form you can use to determine this. This is good info for people who make too much to qualify for a “subsidy” and yet not enough to afford coverage along with the high deductibles and high out-of-pocket costs. I spoke recently to a 42-year-old who was facing $1,000 a month for a family premium, along with $12,000 in annual exposure to deductibles and co-insurance. As he put it, he would be “out” $24,000 for the year before seeing $1 back in benefits. I don’t know how this person voted, but there are plenty of people like him, so it shouldn’t be difficult to understand how so many people could be dissatisfied with “Obamacare” and eager for an alternative.